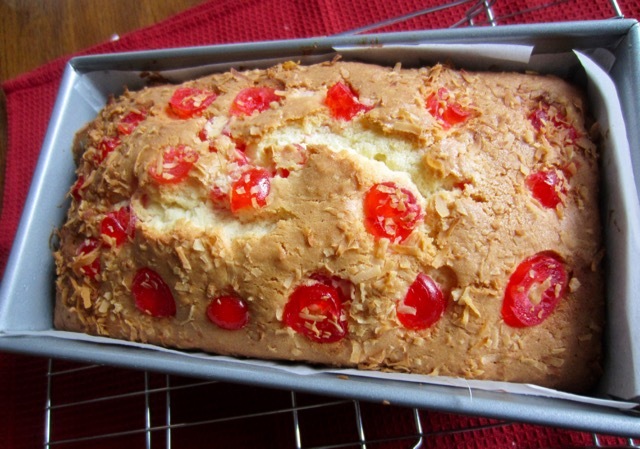 Super easy to make, with lots of desiccated coconut and glacé cherries. We enjoyed eating it! The cake has quite a bit of coconut but I love coconut, so that’s the point. 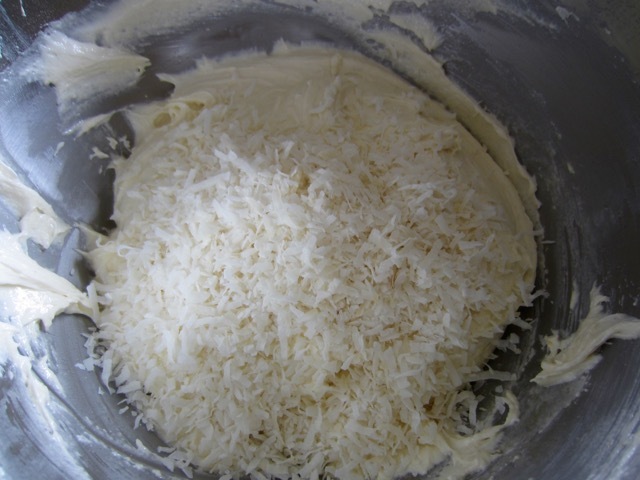 You can reduce the amount of coconut to 1oz (30g). 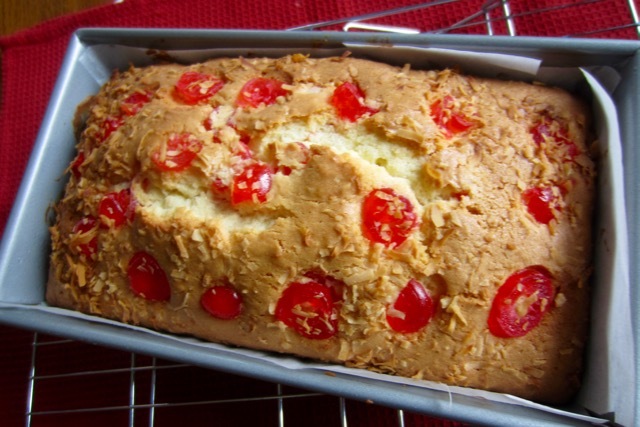 If you don’t like coconut then you will definitely not enjoy this cake. Have a lovely day! Sift the flour and baking powder. 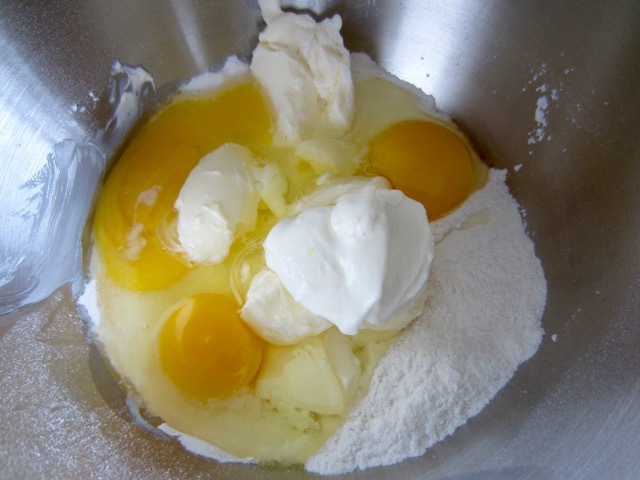 Add the margarine, sugar, eggs, and sour cream to the flour and beat with an electric mixer, starting at a low speed, increasing the speed and beating until all ingredients are fully blended (about 3 minutes). and then fold in the cherries. Spoon the batter into the prepared loaf tin and level the surface. 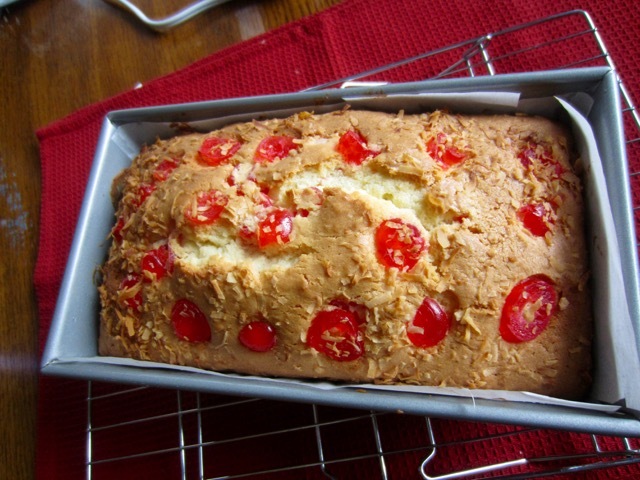 Arrange the extra slices of cherries on top and sprinkle the extra coconut. Bake in the centre of the oven 50-75 minutes until golden or until a skewer inserted in the middle comes out clean. 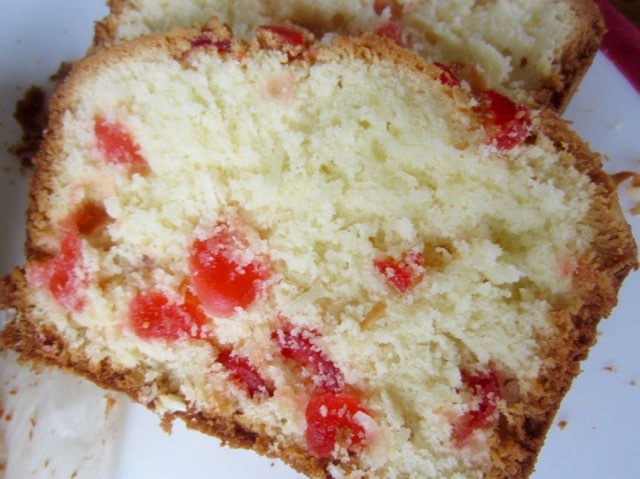 Remove the cake from the oven and leave to cool in the tin for ­15 mins, then transfer to a wire rack to cool completely. Preheat the oven to 330ºF (165ºC) ten minutes before using. Grease and line a 9×5 inch (23 x13cm) loaf pan with parchment. 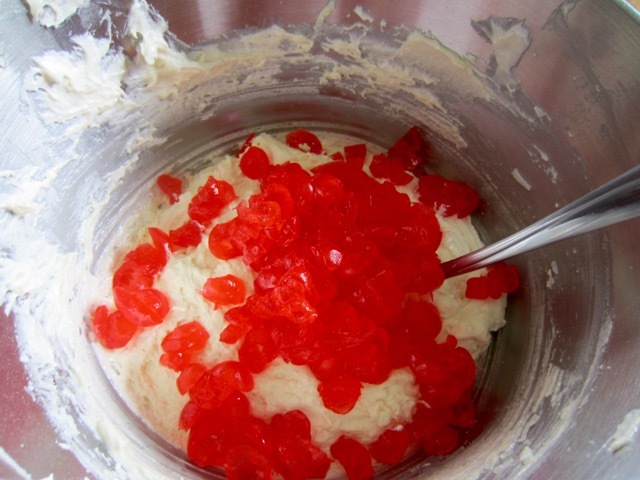 Stir in the coconut and then fold in the cherries. Spoon the batter into the prepared loaf tin and level the surface. 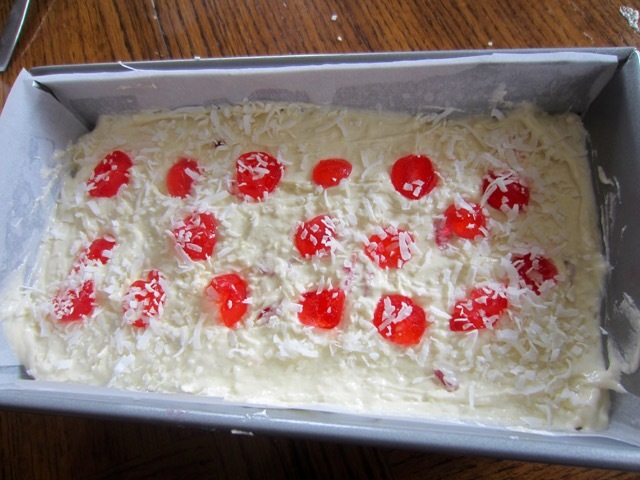 Arrange the extra slices of cherries on top and sprinkle the extra coconut. Bake in the centre of the oven 50-75 minutes until golden or until a skewer inserted in the middle comes out clean. Please note that oven temperatures are given as a guideline only. You may need to add or reduce the suggested temperature depending on your oven. 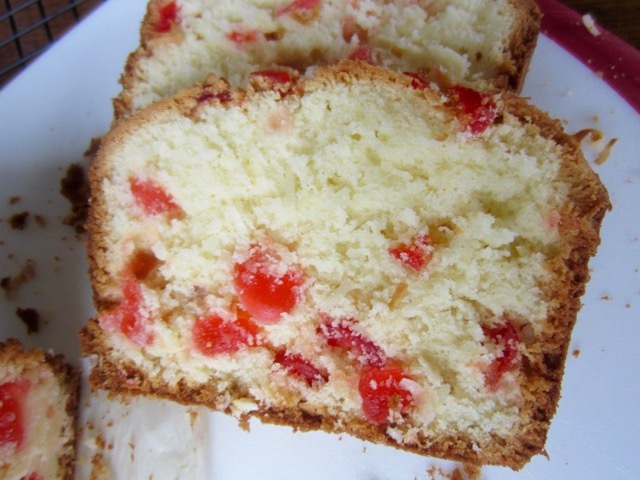 I baked the cake at 330ºF (165ºC) for 75 minutes. Use a bread knife to slice the cake. Prev Are rutabagas a starch? Can butter be used instead of margine? Of course you can use butter instead of margarine. Butter has become so expensive so sometimes, I use margarine which is more economical. Have a great day!